1) Fill a large pot with 2 cups water and bring it to a boil. Add the clams to the boiling water. 2) Reduce the heat to a simmer and let the clams steam for approximately 10 minutes, until the shells open. 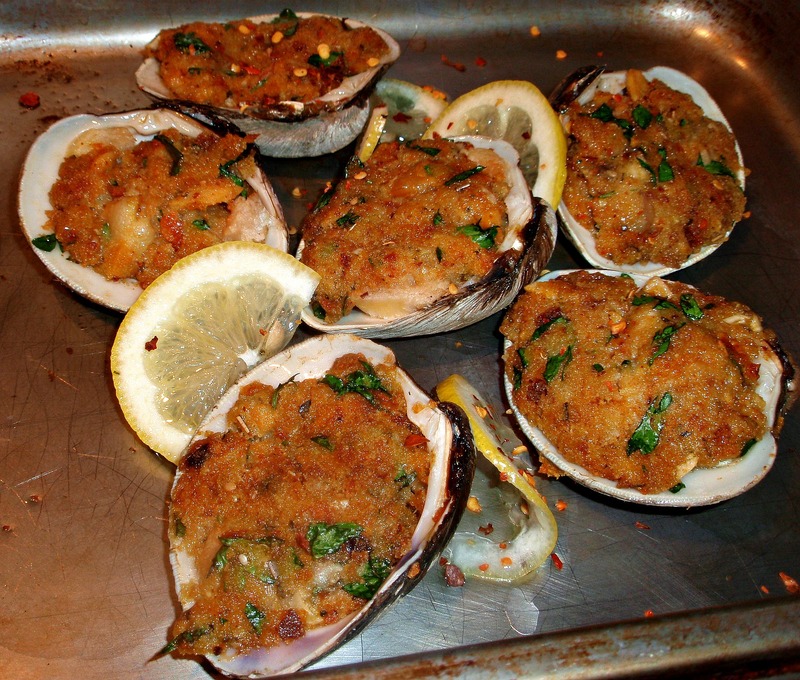 3) Remove the clam meat from the clams and mince the meat finely. 4) Break apart the clam shells from their hinges. 5) Preheat the oven to 350 degrees Fahrenheit. 6) In a frying pan, melt the butter on medium heat and add the minced onion. 7) Once the onions have softened add the garlic. Cook the garlic for 1 minute, then add the parsley, bread crumbs, minced clams, lemon juice, clam juice, and chopped chourico sausage. 8) Let it cook for 4-5 minutes and stir it well. If the mixture is too dry, add more butter or clam juice. 9) Lay the clam shells on a baking dish. Scoop a little stuffing mixture onto each clam shell. 10) Sprinkle with the grated Parmesan. Bake for approximately 20-25 minutes, until the parmesan is browned on top. 11) Take out of the oven and serve with lemon slices for extra flavor. Being Irish/Portuguese,I was “Weened”, on these, Growing older in Rhode Island!… Preferring, using “Linguica Sausage, or a combination, of Linguica/Chourico, Substituting, “Ritz”Crackers, in place of the Bread Crumbs, for an Added “kick”! This dish is more of a traditional New England recipe with help from many cultures like Portuguese chouriço and Italian parmesan. I have been making these for years they are my families favorite. They’re actually quahogs,not clams. Use real bread like you’re making a stuffing and we add green pepper too!